In the world of running, Thanksgiving morning means Turkey Trot. Running USA’s infographic illustration shows how they have become increasingly popular in the past couple of years. As an NCAA athlete, Thanksgiving fell three days into my post-XC season break and so I was always a cheerleader for my dad at our local Turkey Trot in Morristown, NJ. Last year I joined him in the race to gauge my fitness in the middle of some serious base building when I didn’t have XC eligibility. Thanksgiving tradition became a freezing road race followed by thawing out while watching the Macy’s Thanksgiving Day Parade and the National Dog Show on TV before an afternoon/evening full of food. This year was a little different. 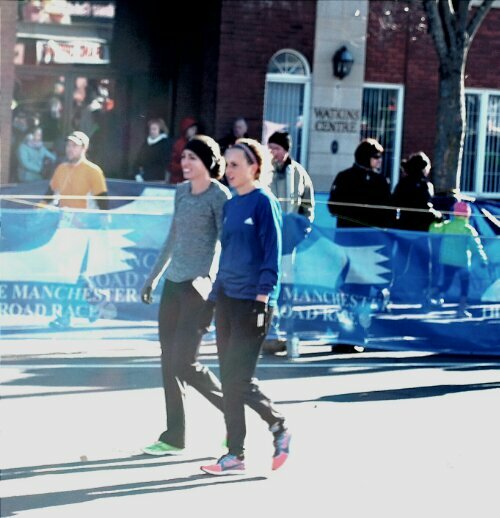 This year I became part of one of the biggest, traditional Thanksgiving Day road races: The 77th Manchester Road Race. Though it was my first, this year’s race seemed to be even more about tradition, as it was Amby Burfoot’s 51st, setting the record for Manchester Road Race finishes. To be perfectly honest, I had some serious self-doubt before this race. I hate to admit it, but I was feeling pretty negative. I have always heard about this race and what an awesome experience it is, and I had been excited about running it all fall. The more I learned about the race from friends and coaches who have participated in it before, the more I became concerned about the 4.748 mile distance (a little longer than what I’m used to) and the monster hill that is the entire second mile. Somehow everyone that told me about this hill did so with a smile on his/her face and assured me that I would have so much fun. Still, once the spaghetti dinner was over and I was sitting in the hotel room thinking about stripping down to my Oiselle uniform in the anticipated 30° weather to climb a crazy hill, I questioned my sanity a bit. I was having moments of mental weakness thinking that it would be nice to know I could bundle up at home and watch the parade on my couch with a cup of hot chocolate. My dad was coming up to watch and then drive us both to my aunt’s house for Thanksgiving dinner, and all I could think was that we would be stuck in traffic eating sandwiches from a rest stop as our Thanksgiving dinner instead. Not my idea of a good tradition. I think these negative thoughts stemmed from nerves. I needed to pump myself up, remind myself why I was there, and answer myself every time I asked what the hell I was doing. 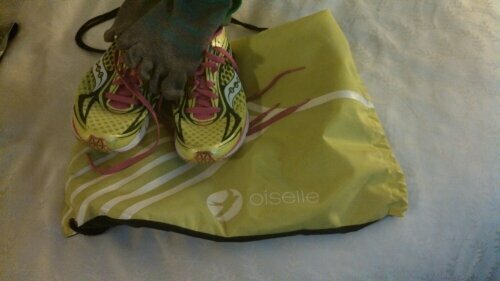 While I was laying out my race day clothes, I started to snap out of it. That Oiselle uniform means something important and I wanted to represent it well. What the hell was I doing? I was doing what I love and being thankful that I can. I was remembering I spent five winters in Syracuse and 30° is nothing (especially with the arm warmers I planned to wear). I was being the confident, fierce competitor that I know I am. Yes, sometimes I experience moments of weakness and I start to get a bit negative. The important thing is that I have ways to get myself back in it and support from a lot of people who remind me to be positive as well. The morning of the race, excitement started to replace my doubts. It was cold, but the sun was out and the way the community shares this tradition in Manchester reminded me, yet again, why I love runners so much. During the warm up, Rebeka and I chose to check out the start/finish instead of dwelling on the hill. I went through my usual routine and by the time we had to take our sweats off, the cold didn’t seem too bad. My Oiselle race kit with the arm warmers, throw-away gloves, and a headband worked out perfectly. The gun went off and the first mile felt pretty good. With a distance like 4.748 miles, it was hard to think about what kind of pace I should hit, so I thought more about being competitive with the other women in the race. I was in a good pack and then I saw 4:59 on the clock. Even though I didn’t think too much about pace, that was faster than I thought. Nevertheless, I tried to keep calm because it was time to start climbing. When I got to the top, I realized I was happy the hill got so much hype from everyone I talked to. It was definitely a big, long hill that you have to grind through, but all the hype made me expect to feel worse on it than I did. It was keeping up on the downhill that everyone flies on afterward that was a challenge, but I managed to survive that as well. Finally, we came around the last turn for the last downhill. I could see the finish line for about 600 meters and I finished strong. In such and elite field, I was definitely happy with my fourth place finish. And yet, once the excitement died down a bit, I couldn’t help wondering if I could have pushed a little harder in the middle and had the leaders a little closer to catch for the finish. First place was 15 seconds in front of me, second was 8, and third was 6. As an athlete, I think it’s important to find a balance between being proud of what I accomplish, and not being 100% satisfied. There’s always room for improvement and I have enough of a competitive drive to want more. I’m willing to work for it. It’s going to be a good year. 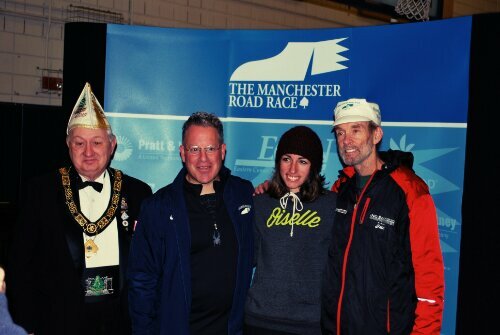 Manchester Road Race Legend Amby Burfoot on the right. 1. The Cabral Family for taking us in Tuesday night so we had a place to stay before Rebeka and I could get into the hotel. 2. Nat for always being supportive with my running career, even when I’m a little crazy like I was when I was sharing my doubts with him Wednesday night and he helped me to stay positive. 3. My family. My dad drove all the way up to watch the race and get me home for Thanksgiving Dinner (no, we didn’t eat rest stop sandwiches in traffic on the highway). My mom is always very supportive even if she can’t always be at the race, I can never wait to call her when I finish. And my brother and sister were home for the holiday as well. I’m thankful that I have all of them, and my extended family, and that I get to spend time with them as often as I do. 4. The rest of my support system: My coaches, past and present, and teammates. I’m thankful that all of these things have come together to help make me achieve my goals and make my dream life happen. I am not the culinary genius in my family. My mother is a wonderful cook. One of five girls in a large Italian family, she can make pretty much anything, not just Italian, and it’s amazing (especially veggie pizza and stroganoff–my favorites!) She definitely tried to pass on this tradition of cooking expertise to my sister and me, but it just wasn’t my thing. Every meatball I rolled fell apart and every vegetable I sautéed burned. My sister, Allison, on the other hand, excelled at these tasks and now has a degree in baking and pastries from the Culinary Institute of America. I remember one night when I was in high school my mom and Allison both had something to do, so I was plan C for dinner. When my dad called on his way home from work to find out what we were having and found this out, his response was, “Eh, I’ll pick up a pizza”. My freshman year of college, the first time Nat cooked for me it was Chicken Parmesan. I sat in his apartment watching him cook and offered to help slice the mozzarella when he realized he forgot bread crumbs and had to run out for five minutes. Somehow in that time I hadn’t noticed that the apartment was filling with smoke and the alarm went off as soon as he got back. It was clear I did not belong in a kitchen. Once I moved out of my freshman dorm, had a kitchen of my own, and started to steer clear of the dining hall, it was do or die (not really because Nat still cooked for me a lot of the time). I slowly learned to put some basic things together. The more comfortable I got, the more complicated the dishes I was trying. Who knows? Maybe I was resistant before because Allison was just so much better at it than me and now I’ve grown to accept that she is just really good at what she does. Or maybe I was just lazy in high school. Regardless, I still can’t say I enjoy cooking, but I do get pretty excited about finding new recipes on Pinterest or hearing about them from friends. 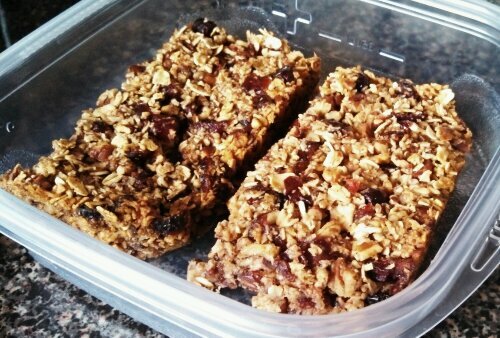 Last week, I found a recipe for my own granola bars. I had been writing “bars” on my grocery list every week for a while and then couldn’t justify paying the amount that they were for six tiny granola bars, so I never bought them. I generally followed this recipe, but made a few changes based on what I had available to use. I haven’t done the exact calculations for the ingredient to yield ratio of the ones that I made (and I should also take into account manual labor), but they certainly are delicious and I’ll definitely make them again. 1. Preheat the oven to 350°. Line a baking sheet with tin foil (easier clean up!) and spread the pecans and oats on it in a single flat layer. Bake them until your kitchen smells amazing and they’re nice and toasty. I just left them in while I chopped the apples. I don’t even know if I can call that a Slap Chop. If that’s what it is, it’s a very early version. It definitely works, but that’s where the manual labor comes in for my little twist on the bars. Put the pecans, oats, dried cranberries, and apples all through the Slap Chop treatment. Do this little bits at a time because the Slap Chop doesn’t do a ton at once. You might need to pick the dried cranberries off the blade every once in a while. Once chopped, mix all the ingredients in a large bowl. 3. 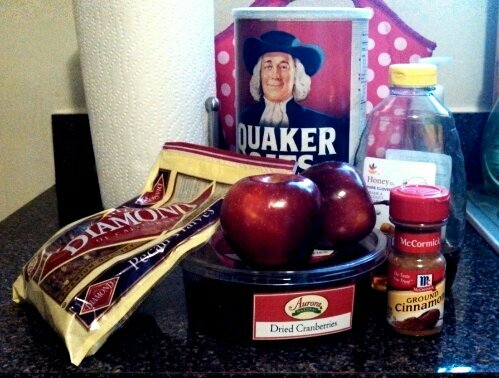 Add the salt, cinnamon, and honey to the bowl of chopped dry ingredients. The original recipe didn’t have honey. My thought is that with a real food processor, the cranberries (or dates as it calls for instead) would be gummy and the apples would be chopped much more and their juices with the gumminess would act as the sticky factor that keeps these bars together. That’s why I added honey to mine and it worked out really well. 4. Line a deep 8×8 square baking dish with tin foil and spray the foil with Pam. Leave extra foil out the sides to use as handles when the bars are done and you take them out. Put the yummy gooey mixture in the baking dish and use a spatula to press it all down tight and flat. Pop it in the oven for 20 minutes. The recipe says 20 minutes, so I would at least check them then if I were you, but I reverted back to my old ways and totally forgot they were in there. Mine got an extra 10 minutes and they were still perfect. Let them completely cool before taking them out of the baking dish and cutting them into bars so that they definitely set and keep their shape. I cut mine into 8 bars, but they’re pretty big and I think next time I’ll cut them into 10. Wrap them individually in plastic wrap and keep them in the refrigerator. They’re a great little post run or snack time treat! 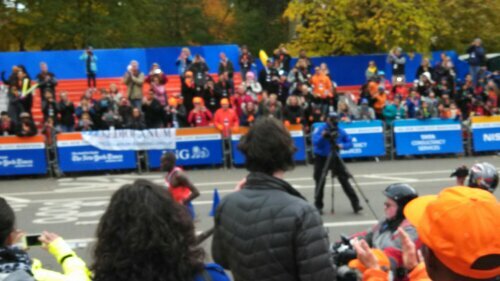 This past weekend I got to be part of an incredible series of events: New York City Marathon Weekend. Growing up right next door in New Jersey made the marathon completely accesible to my family and me for spectating the three times that my dad ran it. I specifically remember standing at mile 15 in a crowd at least 10 people deep that was going crazy encouraging the runners as they went by. Everyone in the crowd wanted to know who the person next to them was cheering for so that they could join in the noise and celebration. I was still a small kid and wiggled my way to the front and when my dad came by, everyone around yelled his name to help get his attention. He ran toward the side and gave my mom, brother, sister, and me hugs and smiles before continuing on. I remember being so proud and excited for him, and the enormous crowds that lined 26.2 miles really shows how special the running community is. Though I was not in the marathon, being an elite participant in the Dash to the Finish 5K the morning before allowed me to become part of the experience. 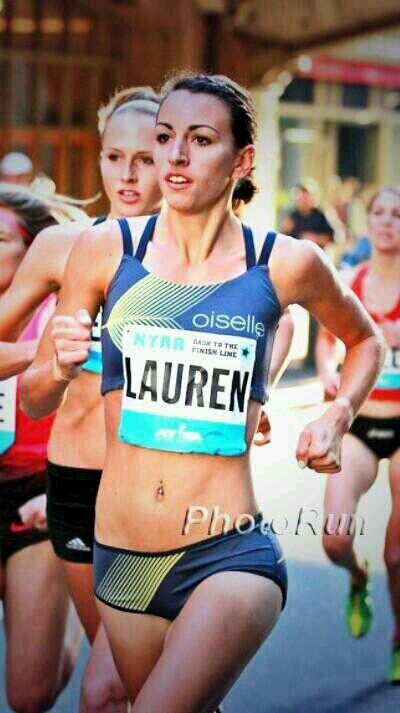 New York Road Runners hosted an amazing weekend. Friday morning, a couple teammates and I went for our pre-race run. Just as we got back and started doing some strides, the sky opened up and it poured. Something about running in the rain makes me feel really fast and strong. After drying off, we hopped on a train to the Big Apple. We stayed at the Sheridan New York, which was a block away from the Hilton, where we got our packets, checked out the hospitality suite, and hung out for a prep meeting with Sam Grotewold (@nyrr_pro), who, along with the whole NYRR team, was awesome and super helpful all weekend. As we got our bib numbers and left the meeting, they took head shots of each of us and we went on our way. 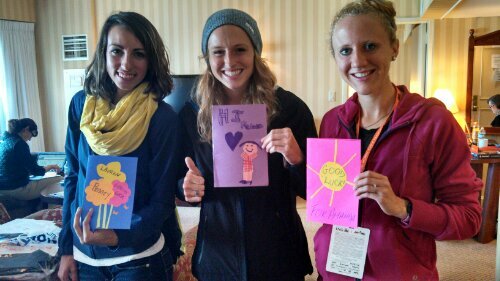 We even got encouraging cards from some young aspiring runners like we did at NCAAs in June! Those kinds of things make me happy. My roommate, Rebeka Stowe (@rebekastowe), and fellow Oiselle teammate Amanda Winslow (@awin250), and I walked the last mile of the course in Central Park to check out the sharp left turn we were warned about. After you make the left turn, the course goes slightly downhill for a little bit before going around a curve back uphill to the finish. When we were walking, we just kind of peeked around that curve and saw the bleachers for the grand stand set up. Assuming that was the finish line, we left the park there and headed back to the hotel before dinner. We should have walked all the way to the finish line… Through some crazy miracle, we were able to find a pretty nice Italian place called Pazza Notte for dinner that was able to seat eight people. A delicious dinner, a quick visit from Nat, and an early bed time. I really haven’t raced in the morning since I last ran cross country (which is now two years ago…weird), so 5 am seemed to be coming too soon. Coach Fox at Syracuse used to always tell me to trust my strength. That advice is the best way I can sum up the race. After my typical race day routine (walk, shower, breakfast, coffee), we met the group in the lobby of the hotel to get the bus over to the starting line and even though it was still pretty dark out, it was relatively warm; a good racing temperature. We went through our usual warm up routine and stripped down to race-ready before finishing up our last couple strides. The bib numbers were huge and said our first names in big letters. Before we got settled in at the starting line, some French and German spectators stopped Rebeka and I asking for pictures! Feeling pretty important and famous, I kind of wondered where those three or four pictures would eventually end up. Once we finally made our way to the starting line, I looked around at the amazing women that I was surrounded by all weekend. I’m getting better at remembering I’m one of them now. I know I’m not Shalane Flanagan or Molly Huddle, so the plan was not to go out with the leaders. After the gun went off, I knew I couldn’t have if I tried. I don’t know what kind of time they ended up going out in, but the leaders went out quickly and to be perfectly honest, the first mile didn’t feel very awesome. That made me panic a little bit because I also knew the first mile was supposed to be flat. This was when I had to remember the mantra: Trust your strength. I stuck with a pack and made it through that mile. I started to warm up a bit and felt better through the second mile before turning into the park for that last mile we had walked the previous day. I survived the sharp left turn, embraced the slight downhill that followed, and started to grind up the last half mile hill coming around that curve. But as I got around the curve, I wished so badly that I had walked all the way to the finish line the day before. The bleachers were visible from there and so I had assumed that meant there was a finish line near by, but this was no ordinary race. The finish line seating was set up for the marathon that was finishing in the same place, and for a race this massive, it had to accommodate for an equally massive crowd of spectators that would gather there. I still had about 100m to the big 26 mile sign, and then another 0.2 miles from there, all up a hill. Somehow I found my strength and made it to the finish line for 9th place in 16:10. I was definitely happy and excited and there was so much energy all around. 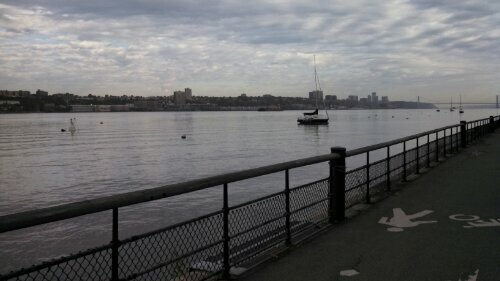 We did a long cool down after the race to make it a “long run” day along the Hudson River Greenway, which had a pretty cool view that I didn’t quite capture with my phone mid stride, but here it is anyway. The long cool down left Amanda and me with very little time to get back to the hotel, change, and get to the Oiselle meet up. This proved even harder when we got back to the hotel and found it absolutely swarmed with people who were probably getting in for the marathon. We waited forever for an elevator, and when we were ready to go back down, we let two packed elevators go by before making the decision to go down all 36 flights of stairs instead (interesting post-race and long run choice). We got on the subway and made it to brunch late, but with plenty of time to eat and chat with some new bird friends who were running the marathon the next morning. Brunch with these women really reminded me (not that I forgot) why I love who I’m running for. I spent the remainder of the day mostly resting up so I’d be ready to watch the marathon the next day. Writing that I had to rest up to spectate feels funny while I’m thinking about the amazing strength of the people who ran the marathon. Nevertheless, I’m glad I did because even though I got a run in in the morning, I did quite a bit of unplanned running to watch as well. 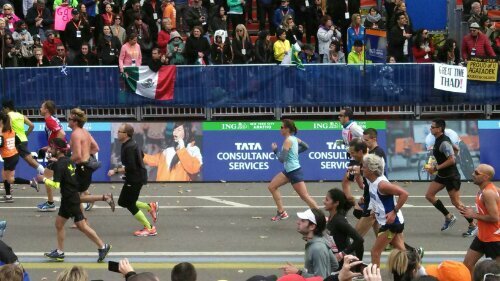 I watched and cheered at mile eight in Brooklyn, headed to the subway to go directly to the finish line. With our athlete passes for the 5k, we also got tickets to the grand stand to watch right at the finish line. The runners had 18 miles to run in that time and we really shouldn’t have had an issue, but the train took forever to come, and once we came up on 57th Street and 7th Ave, we had to get through Columbus Circle. There was a ton of security and the whole circle, plus a block out all the way around it, was blocked off. So we raced wide around the circle and all the way up to 66th street where we could go in. We just got into the park and ran right up to the fence as Priscah Jeptoo came by. Just made it. I tried to snap a picture of Geoffrey Mutai too, but even though I had more time to set up for it, my picture wasn’t so great. I also had a great spot to watch Oiselle Founder and CEO and overall amazing person Sally Bergesen finishing strong and looking fierce! 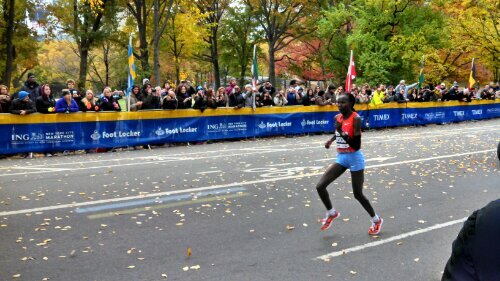 Words can’t really describe the excitement and energy that overtakes so much of the city for the marathon. We stayed at the finish line and watched thousands of people accomplish something so awesome. You could see the pride in the runners’ faces as they crested the hill and approached the line. Being part of the Dash to the Finish and getting to watch all of the amazing people who competed in the marathon made it such a great weekend. I love runners.